Ideal for branch office or kiosk applications, CPM Series Console + Power Hybrids provide security, accessibility and control of critical network elements. WTI offers four different CPM Series families to suit your network management needs. Each CPM product is available in either the basic configuration, or with the Dual Ethernet Option, Current Monitor Option, ATS Option, Internal Modem Option or the W4G Cellular 4G LTE Modem Option. Access & Manage Multiple Console Ports + Control Power via IP or Internal Modem! Ideal for branch office or kiosk applications, WTI CPM Series Console + Power Hybrids provide security, accessibility and control of critical network equipment or any device with a console or maintenance port all in one compact appliance. WTI CPM Series Console + Power Hybrids allow you to remotely access multiple console ports using a single secure IP or internal modem, switch power on/off/reboot on specific outlets, receive temperature alarms when user defined thresholds are breached, change configuration parameters and assign user access to ports and plugs. Each of the four basic CPM model lines can include any combination of the four product options described below. Dual Gigabit Ethernet Ports Option (E): This option provides a secondary 10/100/1000Base-T Ethernet Port in addition to the primary 10/100/1000Base-T Ethernet port included with each basic model. 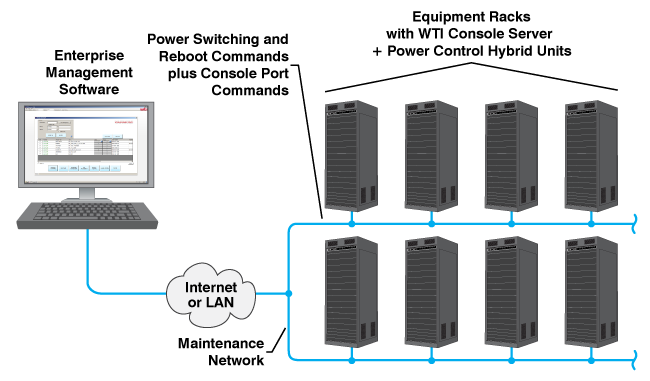 The Dual Gigabit Ports Option allows the CPM unit to be connected to both a primary, production network and a secondary, maintenance network. Built-In Automatic Power Transfer Switch Option (A): The ATS option provides an automatic power transfer switch in place of the split bus/quad bus power configuration found in basic CPM models. When the CPM unit is connected to both a primary power source and a separate secondary power source, the ATS allows the CPM to automatically draw power from the secondary power source in the event that the primary power source fails. Current Monitoring Option (C): This option provides the CPM unit with current monitoring capabilities. When this option is present, the CPM can monitor and log current consumption data and automatically generate alarms if current consumption levels exceed user-defined trigger values. In addition, the Current Monitoring Option also enables administrators to configure the CPM to switch off non-essential outlets when a current alarm is triggered. Internal Modem Option (M): This option adds an internal, dial-up modem to the CPM unit. In many applications, the dial-up modem is used to provide out-of-band access to the CPM unit in the event that network communication with the installation site is interrupted. Designed for remote console access and 120V AC power reboot control for managing small to medium size network installations. CPM-800-1 Series units include eight switched power outlets, eight serial console ports and dual 20 Watt IEC-60320-C13 power inlets. Designed for remote console access and 240V AC power reboot control for managing small to medium size network installations. CPM-800-2 Series units include eight switched power outlets, eight serial console ports and dual 20 Watt IEC-60320-C13 power inlets. Designed for remote console access and 120V AC power reboot control for managing medium to large size network installations. CPM-1600-1 Series units include sixteen switched power outlets, sixteen serial console ports and four 20 Watt IEC-60320-C13 power inlets. Designed for remote console access and 240V AC power reboot control for managing medium to large size network installations. CPM-1600-2 Series units include sixteen switched power outlets, sixteen serial console ports and four 20 Watt IEC-60320-C13 power inlets. In order to prepare for the upcoming switchover to IPv6 protocol, all WTI Console + Power Hybrids now provide full support for both IPv4 and IPv6 (the intended successor to IPv4.) This helps to ensure that WTI Console + Power Hybrids purchased today will be fully compatible with the planned IPv6 internet environment, and will not be rendered obsolete when the IPv6 protocol eventually becomes the new worldwide standard for network communications. All WTI console + power hybrid products include WTI’s convenient Enterprise Management Software, which drastically simplifies the task of managing multiple console + power hybrid units spread throughout your network infrastructure. The WMU Enterprise Management Software provides a centralized command interface that allows administrators to easily manage, label and control multiple WTI console + power hybrid units in large network applications, reducing the time required to access console port command functions and initiate power reboot functions on connected devices. Once installed on your PC or laptop, the Enterprise Management Software can search a user-defined IP address range on your network and discover all WTI console + power hybrids within the range. Discovered units are then added to the Enterprise Management Software’s inventory, allowing administrators to assign a descriptive tag to each console + power hybrid in order to denote the location or function of the device. In addition to providing a centralized interface for remote console port access and remote reboot control, the Enterprise Management Software can also be used to control firmware updates for WTI products and edit and manage user accounts at individual or multiple WTI products.